Saf-T Liner is a high quality U.L. 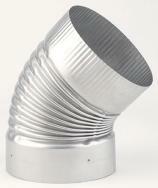 tested and Listed stainless steel lining system designed for relining existing masonry chimneys. 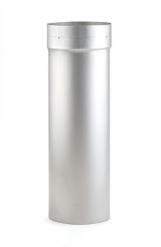 It satisfies code requirements as a substitute for 5/8" fireclay liners and has undergone extensive testing to make it the leader in the stainless steel chimney lining industry. 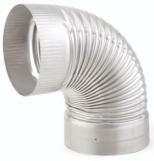 Many people also use it as stovepipe. When you install Saf-T Liner as stovepipe you get a super long lasting pipe that you can be confident will out last regular stovepipe 10 or 20 to 1. It may even out last the original installer. 12" Length; Heat-Fab 304-SS 7"
18" Length; Heat-Fab 304-SS 7"
24" Length; Heat-Fab 304-SS 7"
36" Length; Heat-Fab 304-SS 7"
48" Length-Single; Heat-Fab 304-SS 7"
48" Length-4/case; Heat-Fab 304-SS 7"
Slip Connector; Heat-Fab 304-SS 7"
30 Degree Elbow, Heat-Fab 304 7"
45 Degree Elbow; Heat-Fab 304-SS 7"
90 Degree Elbow; Heat-Fab 304-SS 7"
Adjust. 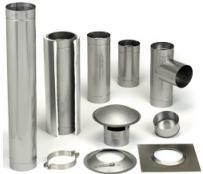 Elbow; Heat-Fab 304-SS 7"
Tee; Rmvbl Take Off; Heat-Fab 304-SS 7"
Tee with 6" Take Off; Heat-Fab 304-SS 7"
Rain Cap; Heat-Fab 304-SS 7"
Fits 7" inside diameter chimney.